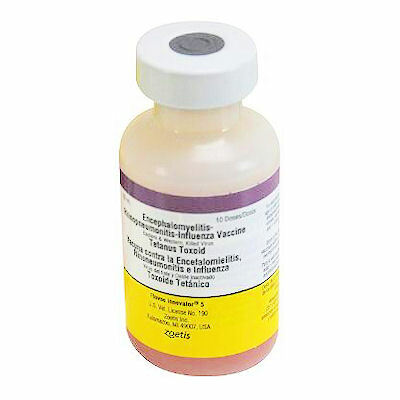 Earn a $25 Gift Certificate for each quantity of two (2) 10 Dose Vials of the following (Zoetis) vaccines. NO LIMIT! $25 Gift Certificates earned can be used on your next purchase of any mix of products, vaccines or non-vaccines as long as the total of your order meets our $59 minimum. 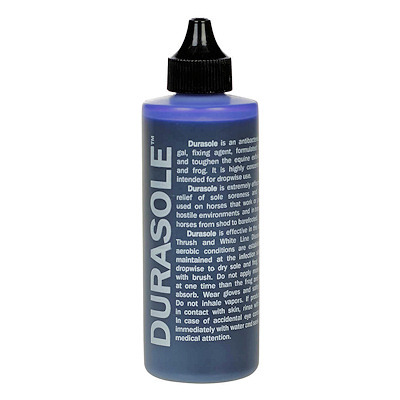 Just Added - 16 Finish Line Products, most include Free Shipping. 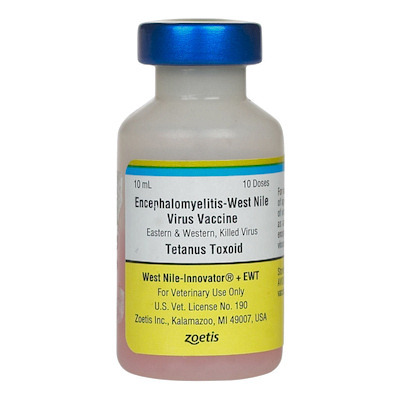 West Nile + 2-way Sleeping Sickness + Tetanus + Flu + Rhino (EHV 4 and EHV 1) an all on one equine vaccine the protects horses 4 months of age or older against Eastern and Western Encephalomyelitis, Rhino (Equine Herpesvirus types EHV-1 and EHV- 4), Flu, Tetanus, and West Nile virus. Please Note:Ulcergard and Gastrogard(RX only) both products contain 2.28 grams of Omeprazole, Do Not pay more for Gastrogard. 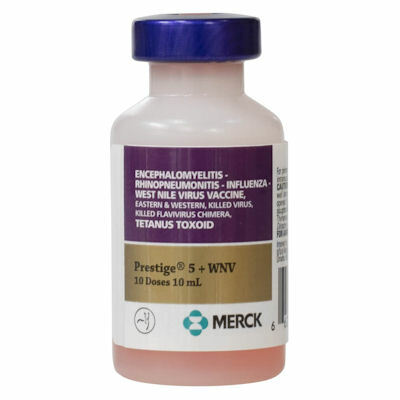 We Sell Vaccines at the Lowest Possible Price. We do not inflate our prices in order to offer advertised discounts. Compare our prices and save! Vaccines Are Non-Returnable and Non-Refundable by Federal Law. on those orders where the Vaccines portion of the order totals $500 or more. 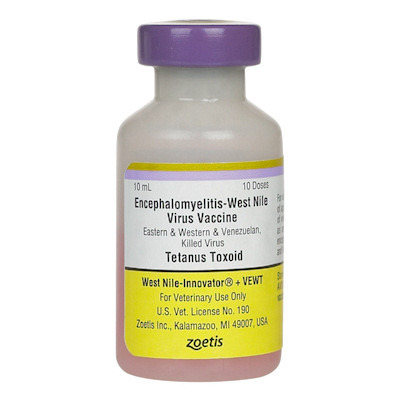 For vaccine orders of less than $500 a flat charge of $25.95 applies. 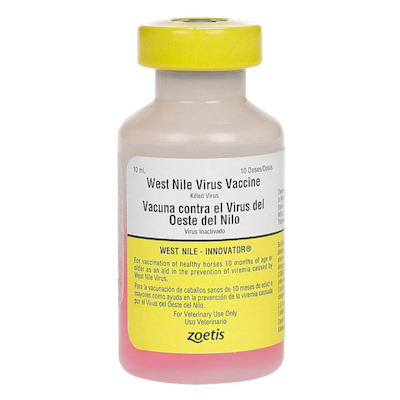 (All vaccine order include a Free $9 Vaccine Cooler with $1 in Ice Packs) ALL VACCINES are shipped separately by UPS Second Day Air on Monday, Tuesday and Wednesday only. 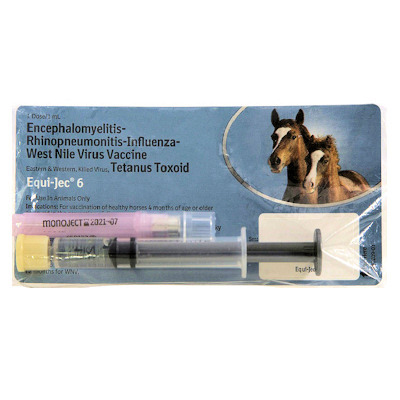 "Thank you for our shipment of vaccines that arrived today,they arrived cold in a cooler with 3 ice packs,I never have to worry,the service is great"
Equi-Jec 6 - 7 way vaccine - Single dose only - Sale Price $40.90/single dose loaded in a syringe with needle. 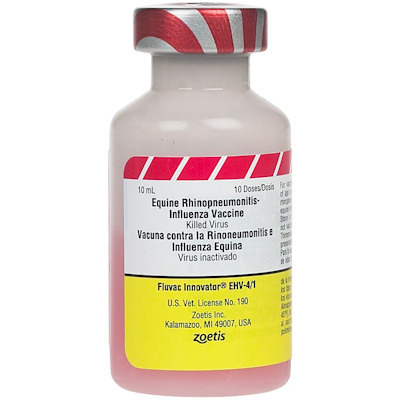 HorseWarehouse.com offers wholesale prices direct to horse owners on over 1500 equine health care products, horse stomach ulcer prevention products including Ulcergard, horse products such as horse vaccinations, west nile horse vaccine, west nile vaccine, Core EQ Innovator, equine vaccines, Starting Gate Granules, Psyllium Pellets, BioGold Plus, Prime Performance nutrition products,Horse Vaccines, Zoetis equine vaccine, Merck vaccines, Equine Vaccines, Boehringer-Ingelheim equine vaccines, Vetera Gold XP, Elanco vaccines, Zoetis vaccines, Merck vaccines, Horse Vaccines, West Nile Innovator, West Nile Innovator + EWT, West Nile Innovator + VEWT, West Nile equine vaccine, Fluvac Innovator 4, Fluvac Innovator 5, Fluvac Innovator 6, Fluvac Innovator EHV-4/1, Botvax B, Encevac T (Intervet), Calvenza 03 EIV/EHV, Vetera GoldXP, Prestige V, Prestige 5 + WNV (Merck), Equine Rabies vaccine, Equirab, Pinnacle IN, Strepvax II, Strangles vaccines, Pneumabort K+1b,Prodigy, Potomavac Horse Fever vaccine, Potomavac + Imrab, Botvax B, Settle for Mares, CDT vaccine for sheep and goats, Tetanus Antitoxin, Tetanus Toxoid, Lepto EQ, Seramune, Fluvac Innovator, Equine E Coli Endotox Paste, Equine Magic Salve, Also offering probiotics Equi-Bac Gel, and Bio-Sponge. Oster, Andis and Wahl clipper blades, vetrap, coflex, 4 inch X 4 inch gauze sponges, Syringes, Needles, Adams Flea and Tick Mist with IGR, Adams Penemite, Andis Blades, Clipper Blades, Elastikon Tape, Equi Spot, Hay Net, Nu Stock. 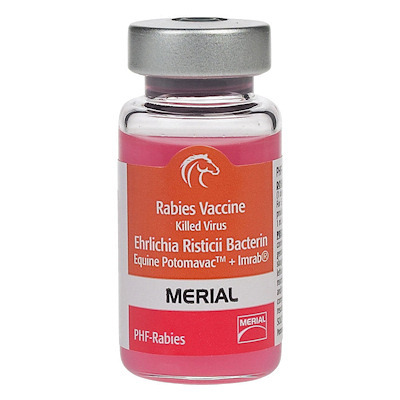 RX products for horses, dogs and cats including Apoquel, Nexgard, Bravecto, Comfortis,Equioxx, Adequan and 352 other RX products. 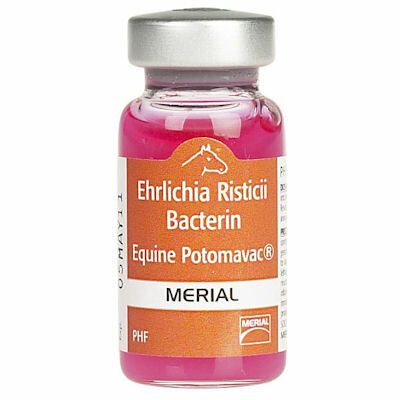 Also offering many popular joint supplements for horses such as APF Pro, Cosequin ASU, Conquer Liquid, Recovery EQ-HA, Cosequin 1400 gram Equine Powder, Cosequin Optimized with MSM, Equithrive, Corta-FLX 100 Ultimate Solution, Corta Flx Powder, Corta Flx Pellets, Four Flex, Four Flex HA, GLC5500, Equithrive, MSM Pure powder,Bio Sponge,Seramune Oral IgG, and Foal Response Colostrum paste for new born foals. 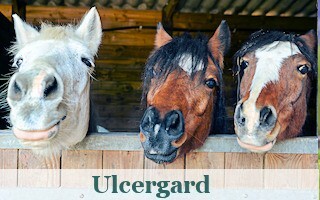 UlcerGard, Succeed and Starting Gate Granules. 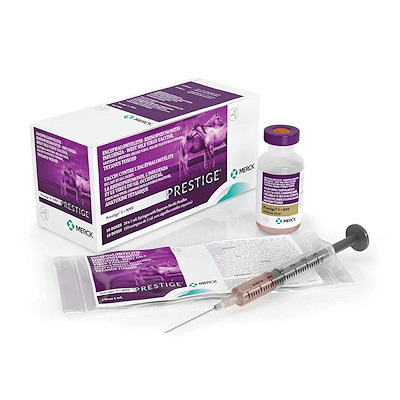 Durasole, Biotin 800 Pellets, Biotin 800Z pellets, Vetericyn HydroGel Spray and Vetericyn VF Spray, Biotin Pellets, Cipex Pellets, cushings Blend, Derma Cloth, EcoVet Fly Repellant, Strongid Paste Horse Wormer(Zoetis), Epsom Salt, Equi Bac Oral Gel, Furazone, Grand Coat Supplement, Grand Complete, Grand Flex, Grand H.A., Grand Vite, Grand Meadows Hoof Powder, Herbal Bute, Latex Exam Gloves, MSM powder, Muscle Up Powder, Permethrin 10%, Recovery EQ-HA, Remission, Repel XP, Say Whoa, SBS Hoof Builder, Stethoscope, Super Lyte Electrolyte Paste, Equine Fly Mask, Thrush Magic, Thrush Stop and Wipe. 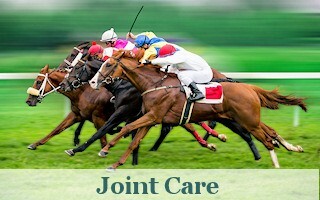 All Natural and Homeopathic horse health care products are also offered with Free Shipping included on orders of $59.00 or more of non-vaccine products. 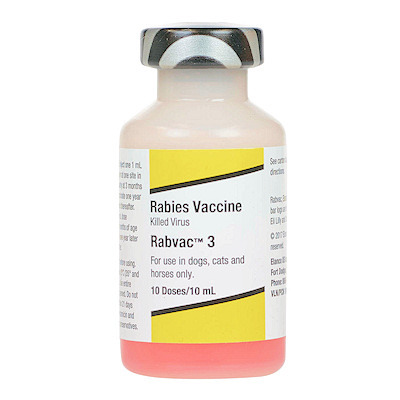 Also offering Boehringer -Ingelheim and Elanco canine and feline vaccines: Nobivac Canine Flu Bivalent vaccine, Spectra 9, Lymevax, Nobivac Lyme, Nobivac Canine 1- DAPPv, Nobivac Canine DAPPv + CV, nobivac canine 1-DAPPv +L4, Vanguard Plus 5, Nobivac Puppy DPV, Nobivac Intra Trac 3, Bronchi Shield Oral, Bronchi Shield 3, Bronchicine ca, Nobivac Canine Flu Bivanent vaccine, Duramune Max 5, Duramune Max 5/4L, Duramune Max 5 CVK, Duramune Max 5 CVK 4/L, Kennel Jec, Spectra 9, Nobivac Canine vaccines, Nobivac Canine vaccines, Nobivac FeLV, Nobivac 1 year Rabies, Nobivac 3 year Rabies, Rabvac 3 and Rabies Tags, Also offering Elanco Canine and Feline vaccines, Feline vaccines Nobivac Feline 1-HCPCh, Nobivac Feline 1-HCPHCh + FeLV(Feline Leukemia) Neo Par, Neo Vac DA2, Nobivac Influenza Bivalent vaccine, Canine Flu vaccine, Vanguard Plus 5, Vanguard L4, Lepto 4, Frontline Plus for dogs, Frontline Plus for cats, Bio Spot for dogs and cats, Fish Flex, Fish Mox, Fish Tapes, Fish Zole, Fortiflora, Microchips, mini-microchips, Nemex 2, Save A Hoof Spray, Shoeing Hammer, Tapeworm Capsules, Terramycin, Topical Fungicide, Total Calm & Focus, Veterycin Liquid Wound Spray, Vetrap, Vitamin B-12 Gel, Vitamin E 800 Powder, Vitamin E and Selenium, WormEze Liquid, Zodiac Spot On. Free Shipping is offered on all horse products within the 48 continental U.S. states on orders of $59.00 or more, not including Vaccines. 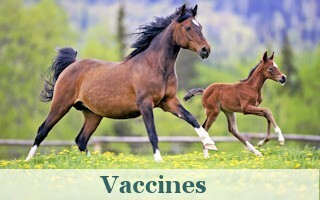 All vaccines are Shipped UPS Second Day Air or UPS Next Day Air. Vaccines are Non-Returnable and Non-Refundable. 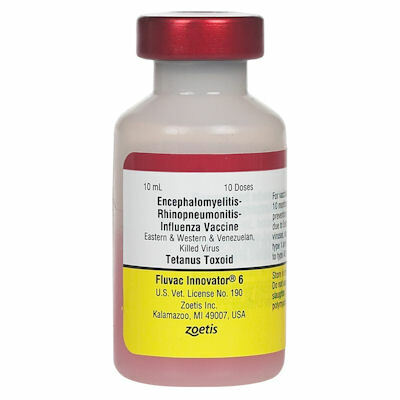 *The Take Five discount is not valid on RX product orders. ©Copyright 1996-2019, Horse Warehouse, 26 Northshore Dr., Lake Ozark, MO. All rights reserved. Information subject to change without notice.